The claimant count in Devon, although lower overall, has followed the same pattern as nationally. 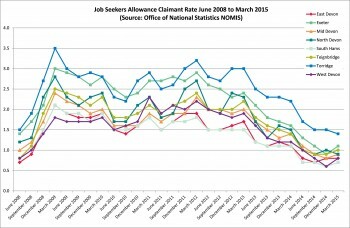 From a low point in June 2008 through to June 2009, Job Seekers Allowance claimants across the whole of the UK increased by 87%. In the South West rates increased by 130% over the year. In Devon the increase was 131%. 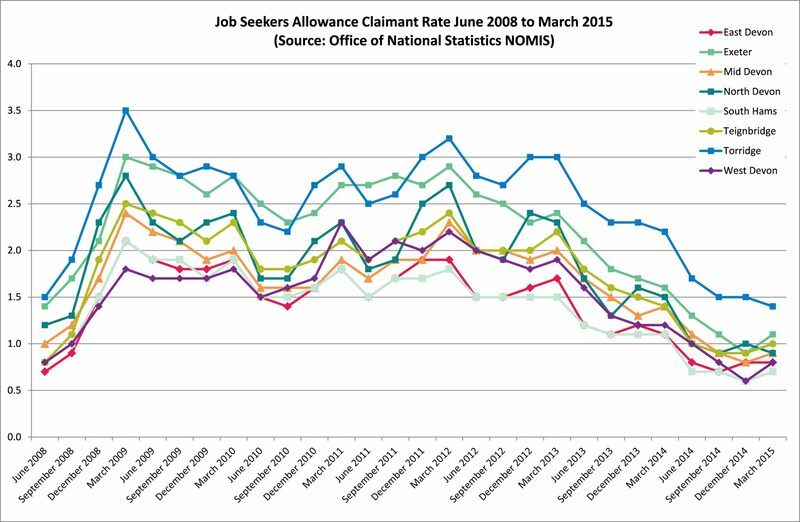 Figure 5.1 shows the trend in Job Seekers Allowance claimants by local authority from February 2008 to March 2015. It shows unemployment had remained above the pre 2008 level and varied considerably by local authority with Torridge in particular showing a higher rate than the South West overall, however in the last 6 months rates have returned to similar levels as 2008. The overall claimant count rate for Devon in March 2015 was 0.9%, and was higher for males (1.2%), than females (0.7%).